Wild morning, pretties! Autumn is here and what can be better than drinking a relaxing tea in the chilly evening? 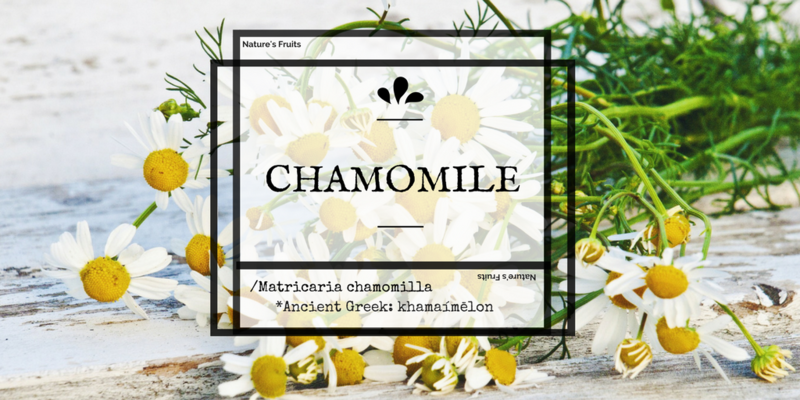 Chamomile is one of the oldest plants in the world and one of the healthiest natural and organic ingredients there are. Also known as a flower of the sun, we’re all familiar with the plant of small white and yellow blossoms with a tranquil yet aromatic fragrance. 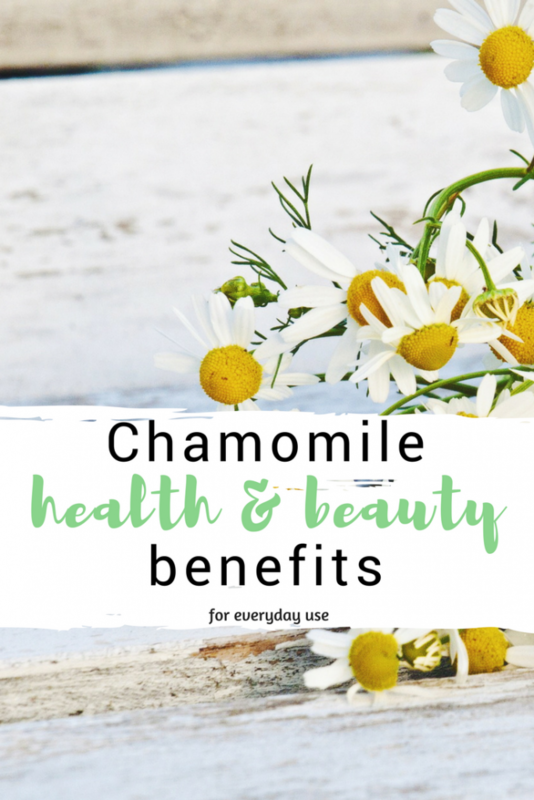 There’s more to this plant than just the smell; which is why I’ve gathered the amazing and soothing chamomile health and skin benefits all in one place! My grandmother used to grow chamomile bush in her garden, along with calendula, roses, small forest strawberries, and mint. I always remember the relaxing and strong smell of the chamomile and roses in late August evenings. Chamomile is one of those natural and organic ingredients that has always had a special place in my mind as well as in my cupboard. No matter how small, this plant is useful all around (really, all around) and it goes by the Latin name of Matricaria chamomilla, also known as the Water of Youth. There is another type of chamomile, namely Roman chamomile or Anthemis nobilis. 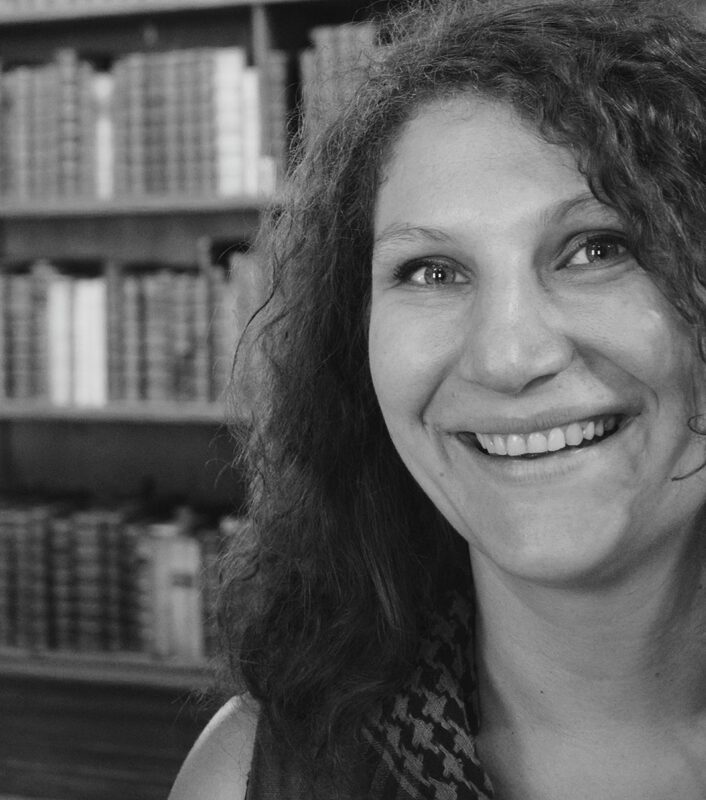 But we’ll focus on the first one, also known as the German chamomile, in this post. When it comes to chamomile’s utility, there are various uses of this plant, but chamomile tea is the most well-known and popular. Use the tea to make chamomile baths and compresses. The Latin name for chamomile, Matricaria, derives from the word mater, which means mother and it is considered a feminine plant because its compress soothes menstrual cramps. 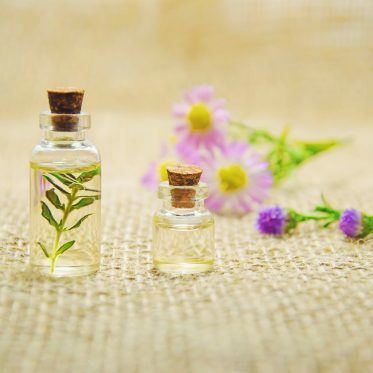 It has been used for centuries and the chamomile health and skin benefits spread far and wide since it is one of the most powerful natural herbal remedies. Often chamomile is one of those natural and organic ingredients added to various types of skin cosmetic products because it is thought to have emollient properties. Apart from that, chamomile promotes healthy skin and is a perfect natural remedy to irritated skin. 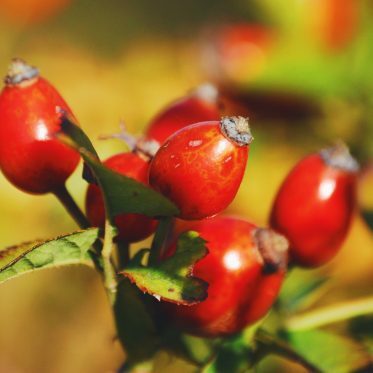 It can be used to treat dark spots, signs of aging, dandruff, and scars. Mix everything in a bowl until all the ingredients are well blended (leave out the dried flowers; I usually added them straight to the bath). Store in a jar until you want to use it. I’d say you need about ½ cup per bath. 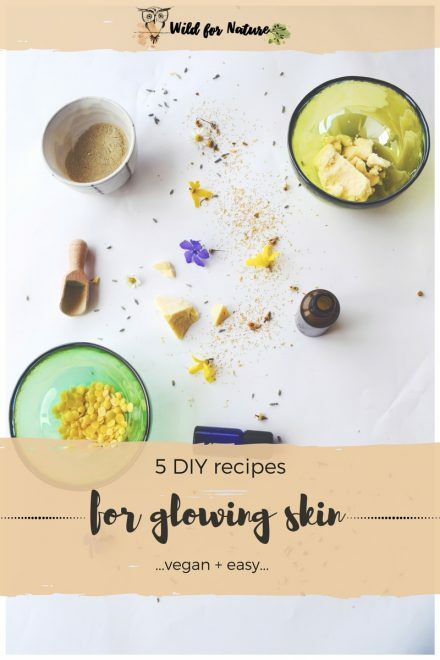 You can add more if you wish to, and remember to add a few tablespoons (2-3) of dried chamomile flowers as well. Get in the bath and relax, unwind and let the chamomile work its magic. Soak for about 30 minutes. Rinse with warm water and apply a lotion/moisturizer/body oil as you normally would. Get in your comfy clothes, make a cup of tea and watch a good movie, wrapped in a cozy blanket on the couch. 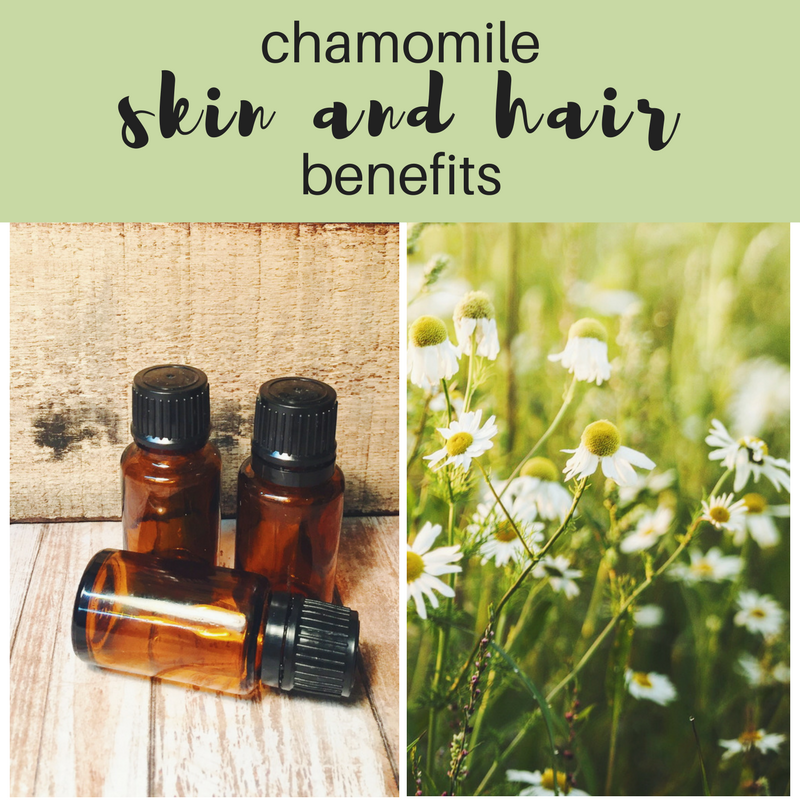 The chamomile health and skin benefits have positive effects on the hair as well. 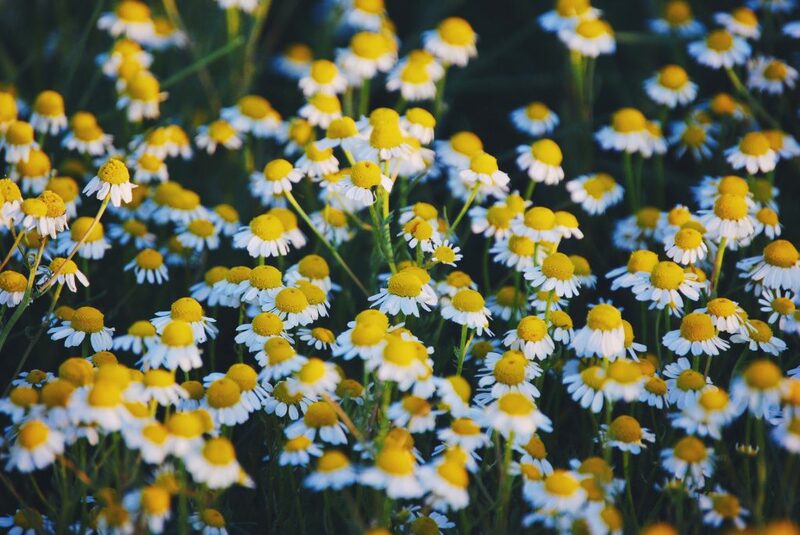 Chamomile nourishes and soothes the scalp, strengthens hair follicles and stimulates hair growth. Chamomile is the correct answer in the case of an itchy scalp as well as shiny hair. In case you want to lighten your hair color without the harmful chemicals in store-bought bleach, chamomile can do that too since it works as natural hair bleach. Prepare chamomile tea (brew). After the tea gets cooler, rinse your hair with it, before conditioning. What you can do is also pour the brew into a small spray bottle and apply the tea all over your hair once you’re done washing it. Keep in mind that doing this regularly might lighten up the color of your hair (natural bleach, remember?). That’s why, in case of an itchy scalp, I apply chamomile tea to the scalp itself with a pad or my hands and massage it well. I rinse it off with water and apply conditioner as I normally would. Combine the ingredients into a paste. Apply it to your hair (for a more detailed guide on how to apply coconut oil, have a look at my older post on coconut oil hair mask). After an hour wash out the mask and shampoo as you normally would. I’ve mentioned it a few times by now, I know, but start with chamomile tea. Pour the boiling water over the dried flowers and let it sit for 10 minutes. 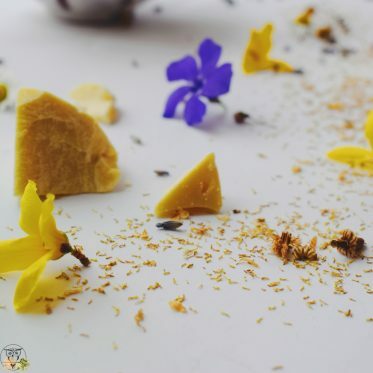 The only thing to remember is that you shouldn’t cook chamomile blossoms. This way they lose their positive and healthy properties. 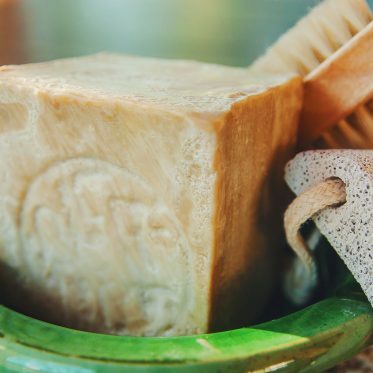 In case this list of chamomile products and chamomile health and skin benefits isn’t enough for you, head over to The herbal academy and their post on 23 ways to use chamomile. 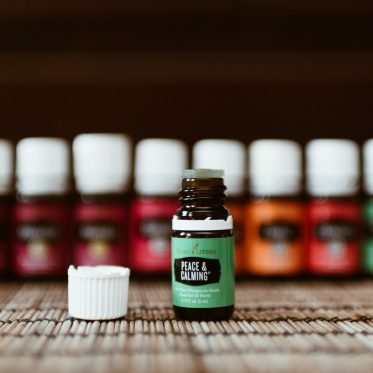 They have more chamomile ideas and DIY projects listed for you to try. How often do you use chamomile in your life? 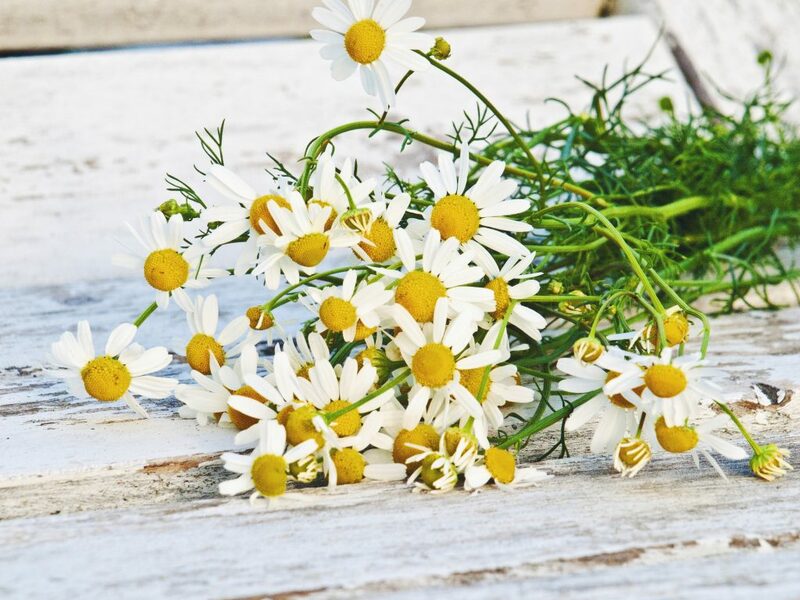 What’s your favorite one of all chamomile health and skin benefits? Previous PostNatural Sunscreen Oils (+ Natural Tanning Oil Recipe): Should You?